One of the oldest public libraries in India. It has collection of more than 10 lakh books. Started In 1896; named after the Lord Connemara the then Governor who laid foundation for the Library. It has uniform membership facility. 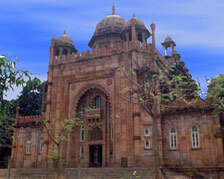 It is situated in the campus of the Museum, Egmore. The library is open all seven days from 09.30 Hrs to 19.00 hrs excepting on Sundays it closes at 18.00 Hrs.